At this time of year we have lots of vegetables in the garden, including tomatoes, zucchini, beetroot and basil. So Yotam Ottolenghi’s recipes, with their strong bias towards veggies, are perfect. We’ve been eating so many of his amazing recipes lately that Matthew says he wouldn’t be surprised to walk into the kitchen and find the man himself. 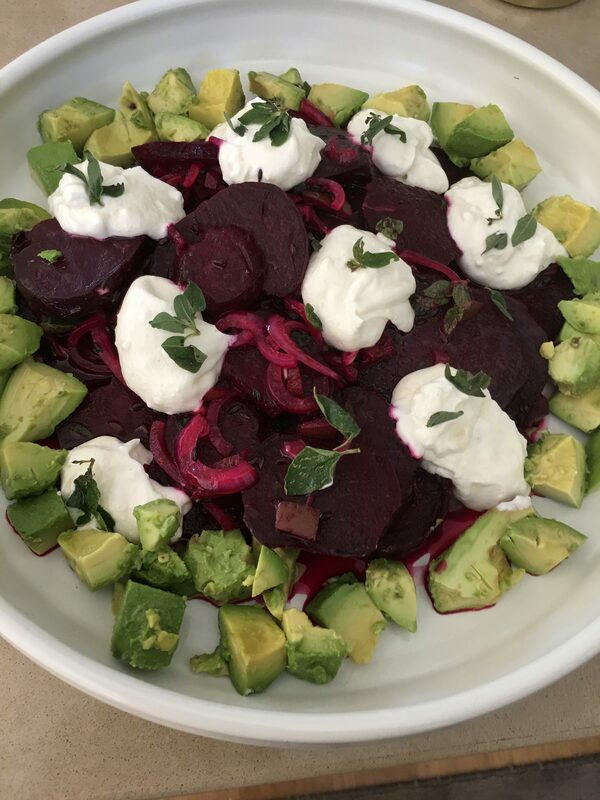 This week I made his Roasted Beetroot with Yoghurt and Preserved Lemon which I served for lunch with avocado. 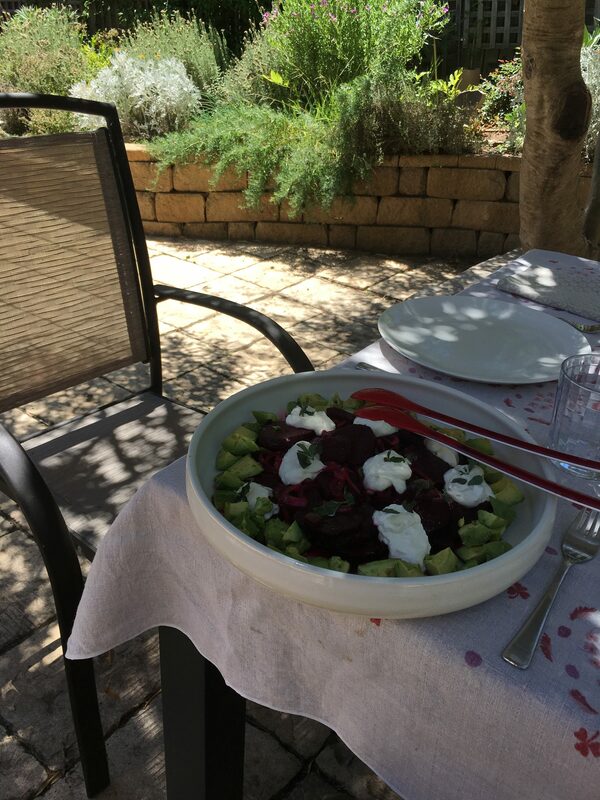 We sat in the garden under the olive tree sipping a glass of chilled white wine and enjoying this delicious, not to mention healthy, combination. If you don’t have any preserved lemon, just leave it out or add some grated lemon rind. I used fresh marjoram instead of dill, but you could also use fresh basil or chives. Preheat oven to 200°C. Wash and dry beetroots, but leave skin on. Wrap each one in foil then bake for about an hour or until tender. Test with a sharp knife or skewer. When cool enough to handle, peel and slice into a large mixing bowl. Heat olive oil and cumin seeds for a few minutes in a small frying pan, until seeds start to pop, then tip over the beetroot. Add the onion, preserved lemon, lemon juice, half the herbs and season to taste. Mix well then transfer to a shallow serving dish. Mix the Tahini into the yoghurt then put blobs all over the top. Peel and dice the avocados and arrange around the edge of the plate. Garnish with the rest of the herbs. Whenever we go to our daughter’s in Newcastle we eat lots of rocket. It grows there like a weed. I much prefer the larger flat leafed rocket you can grow to the skinny wild rocket sold in supermarkets. 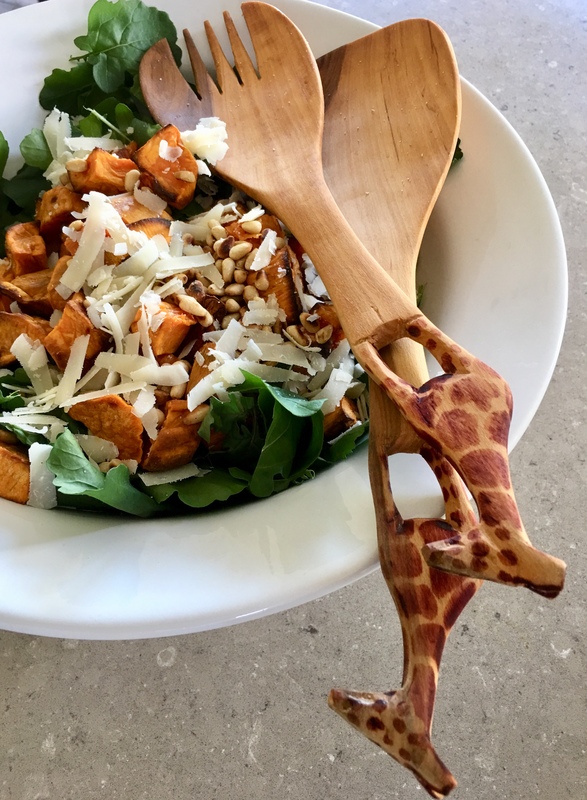 This salad is delicious with or without the sweet potato. Preheat oven to 180°C. Mix sweet potato chunks with the oil and a little salt, then spread out on a shallow baking sheet. Bake for 20-30 minutes or until starting to brown. Make dressing by shaking all ingredients in a jar with a lid. 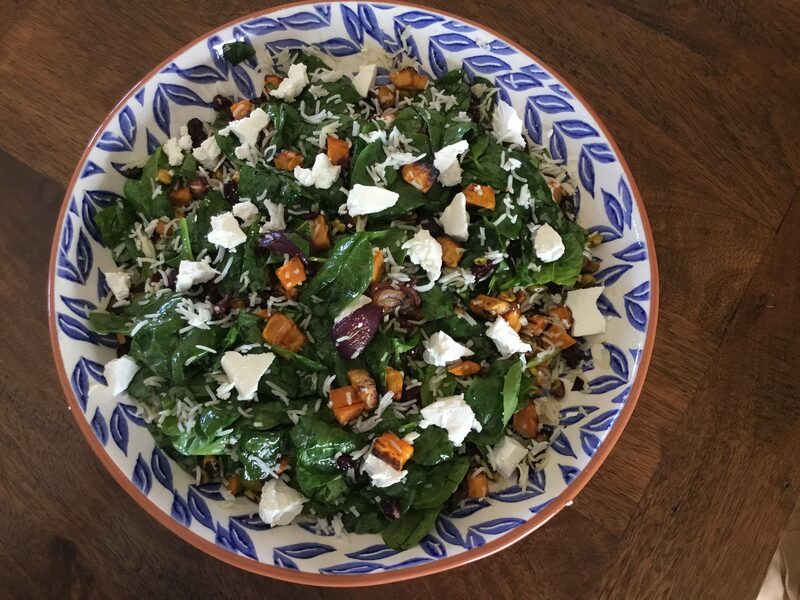 Place rocket, sweet potato, pine nuts and parmesan in a large salad bowl. Add some dressing and mix thoroughly to coat. Variations: use pumpkin instead of sweet potato. Use goat’s cheese or feta cheese instead of grated parmesan. Kale is a member of the brassica family, which includes cabbage, cauliflower, broccoli and brussels sprouts. First cultivated around 2000 BC there’s nothing new about this green leafy vegetable, but in the past few years it’s enjoyed a revival as a super food. Packed with vitamins and minerals, kale has high levels of vitamin K and C as well as iron. Antioxidants make it great for lowering cholesterol and while you can cook it, just like spinach, the best way to maximise the nutritional benefits is to eat it raw. The first kale salad I made was tough and chewy. I ate it because it was good for me, not because I enjoyed it. But the following day I discovered that the leftovers were delicious. The trick is to dress the salad several hours before serving, so the kale leaves soften. Then you add a bit of crunch to the salad just before serving with some nuts, seeds and crispy pita bread. 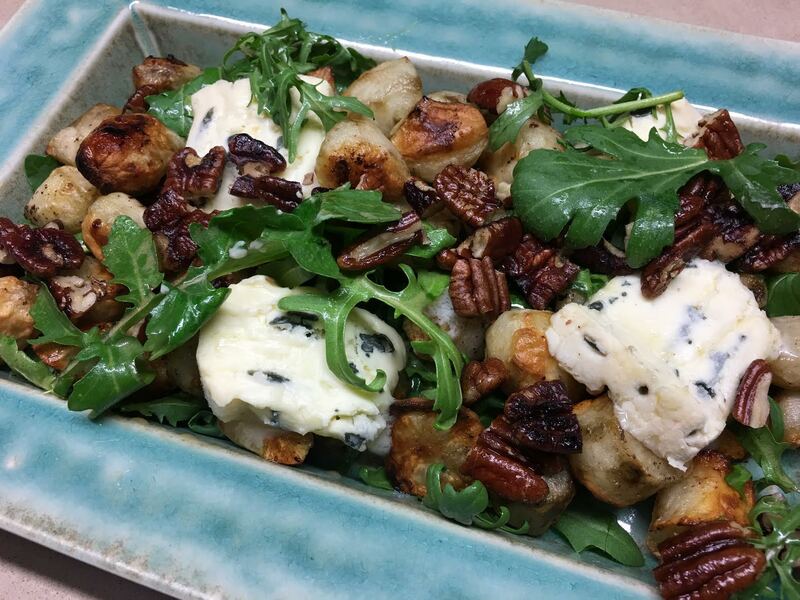 My brother David passed on this recipe from a café where he had lunch in Vancouver recently. The “recipe” came from dissecting and studying what was on his plate and taking notes. I’ve further adjusted his version with the addition of tahini to the dressing and crunchy fried pita bread on top. Wash kale, spin dry then remove stalks and slice thinly. Cut cauliflower slices into smaller pieces. 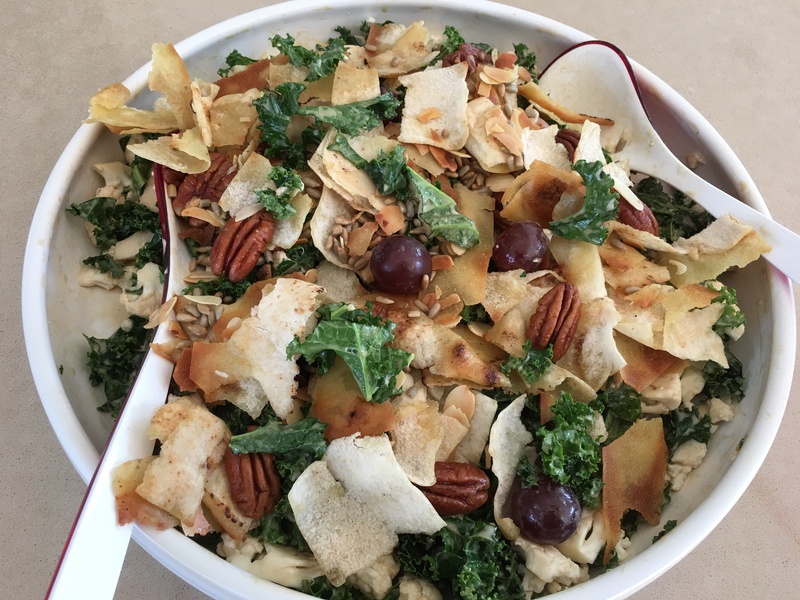 Place kale, grapes, cauliflower and onion in a large salad bowl. Using a stick blender or food processor mix all ingredients for dressing till smooth, then pour into a jar. Add enough dressing to moisten the salad, mix well then stand for several hours before serving. You will have enough dressing left for another time. Meanwhile for the topping, separate the two sides of the pita bread and cut 2-3 cm pieces. Heat oil and add the pita, nuts and seeds. Cook over moderate heat, stirring, until pita is golden. Give the salad a final mix, top with the pita mixture and serve. Variations: use pine nuts instead of pecans or almonds. Use spinach instead of kale. This recipe was given to me some years ago by my friend Donelle. She made it with Pak Choi but today I decided to use fresh spinach from the garden, because we have copious amounts. I’m not sure if you can buy packets of crispy noodles everywhere in the world. If you can’t find them substitute crushed corn chips. Just something to give a bit of crunch. The pomegranate arils weren’t in the original recipe, but they add a touch of colour. Some supermarkets sell these either fresh or frozen. I keep them in the freezer and just scrape out a few as required to sprinkle over the top of salads. Full of iron and other good stuff, this recipe is very healthy! Wash, spin dry and shred the Pak Choy, spinach or kale with a large sharp knife. Place in serving dish with the nuts, which have been lightly toasted in a dry frying pan over moderate heat. Add spring onions and coriander. Place all ingredients for dressing in a jar and shake well. Mix dressing with salad and top with the crispy noodles. If liked garnish with pomegranate arils and serve immediately. We’ve tried several times to grow figs at the farm. Each time, despite great care (deep hole, sheltered position etc) the tree doesn’t make it. So unfortunately figs are one of the fruits I have to buy. They’re in season for such a short time and they don’t freeze well, so make the most of them while you can. Another delicious way to serve them in a savoury dish is with Smoked Salmon. Heat oil in a large frying pan. Place figs in the pan, cut side down and cook until lightly browned and caramelised. Remove from pan. Place all ingredients for dressing in a jar and shake well. Mix salad greens with some of the dressing and arrange on a large, flat serving dish. 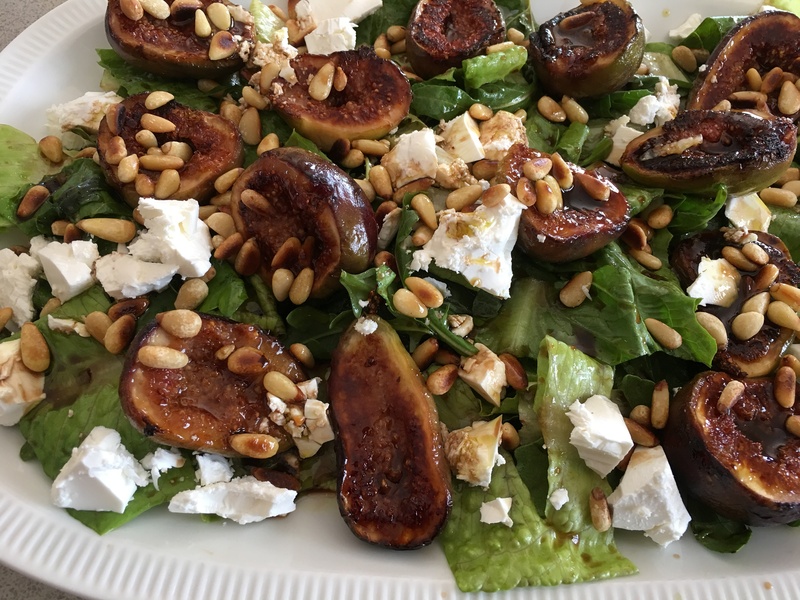 Arrange the figs, cheese and pine nuts on top, then drizzle with more of the dressing. Lunch with our dear friends Lorna and Jim is always a pleasure. At our recent catch up Lorna served this delicious salad with confit salmon, followed by strawberries and ice cream. The original recipe said to leave the skin on the sweet potato, but I decided to peel mine as it was rather blemished. If you’re missing one or two ingredients don’t worry, I’ve listed some substitutions which would work. Preheat oven to 180°C. Scrub sweet potato or peel if preferred, then cut into 1.5cm cubes. Mix with the onions and 2 tsp olive oil then spread out on a baking tray lined with baking paper and bake for 25-30 mins. Remove from the oven and cool. Meanwhile place rice in a saucepan with the water and a pinch of salt. Bring to the boil then cover and turn down the heat as low as it will go and cook until water has been absorbed. Turn off heat and leave to continue steaming. Cool. Place dressing in a jar with a lid and shake. Place all the ingredients in a large salad bowl. Add the dressing and toss. While staying with our son and daughter-in-law in London they served this unusual rice salad from Yotam Ottolenghi’s latest cookbook Plenty More. It’s delicious on its own, but they served it on individual plates, topped with a portion of pan-fried salmon with crispy skin. 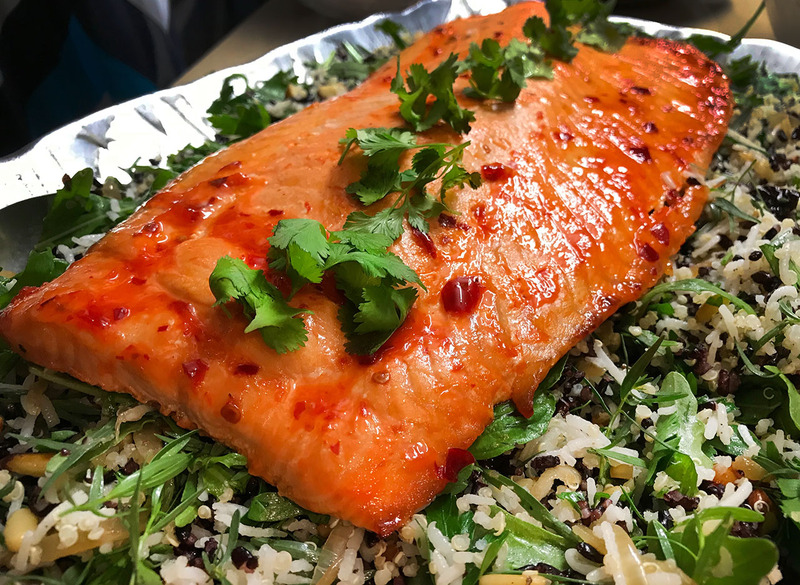 For a recent buffet dinner I made one and a half times the rice salad, then baked a one kilo side of skinned and deboned salmon (from Costco), brushed with Thai sweet chilli sauce, at 200°C for 8-10 minutes and placed it on top of the salad. I prepared all the ingredients for the salad earlier in the day and mixed everything together 10 minutes before serving. The salmon can be hot or at room temperature. I couldn’t find wild rice in Coles, Woolworths or Aldi. The health food store had a packet of 125g for $9.95 which works out at $80 a kilo. Ridiculous! Black rice, which costs around $10 a kilo can be found in all major supermarkets in Australia. It’s a very good substitute and a great colour contrast to the basmati, so I used that. Ottolenghi cooks the basmati rice by the absorption method. I prefer to cook it in plenty of boiling water, the same as the wild/black rice and the quinoa, so you have more control over when to stop the cooking process. You want all the grains to have a bit of bite to them – al dente as the Italians say. Place wild rice in a pan, cover with plenty of water, bring to the boil then simmer for 35 minutes until cooked but firm. Drain, rinse under cold water, drain again. Cook basmati rice in plenty of boiling salted water until cooked but firm. Drain, rinse and drain. Cook quinoa in boiling water for 9 mins then drain, rinse and leave to drain. Place the almonds and pine nuts in a small frying pan with one tablespoonful of olive oil and a pinch of salt. Cook stirring until just starting to colour then set aside. Heat sunflower oil in a large frying pan and add the onions, a pinch of salt and some ground black pepper. Cook over high heat for 5-8 minutes, stirring often, until onions are soft with a few crispy bits. Drain on paper towels. 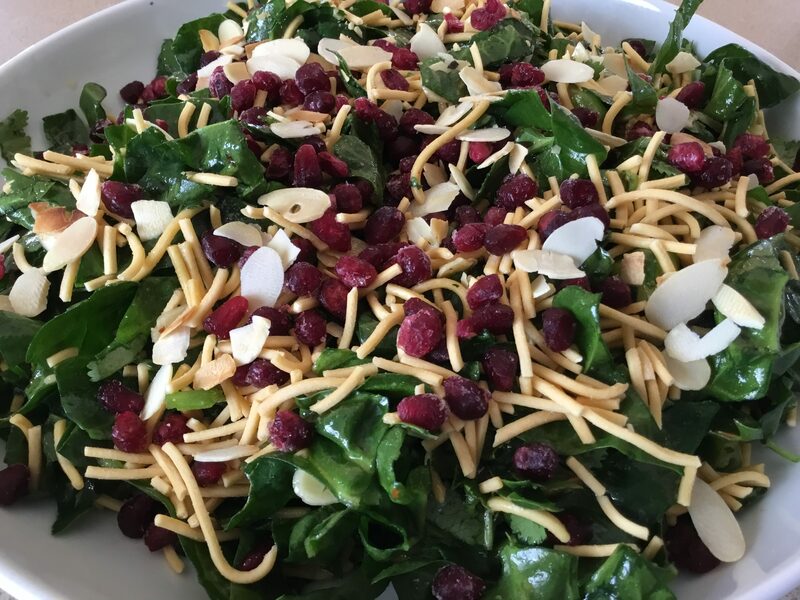 In a large salad bowl place all the grains, chopped herbs, rocket, fried onion, nuts and sour cherries. Add the lemon juice and zest, the remaining 3 Tbs olive oil, the garlic, half a teaspoon of salt (or to taste) and some pepper. Mix well then stand for 10 minutes before serving. Serve the salad as it is or topped with grilled, pan fried or baked salmon. This is an unusual coleslaw because it doesn’t contain any mayonnaise. If you have a food processor with a grating attachment it’s very quick to make, but you can of course do the grating by hand. 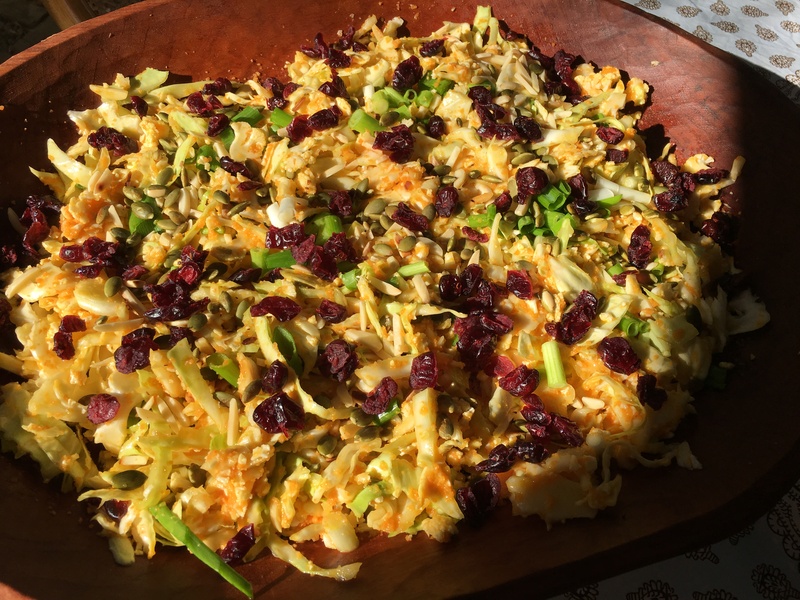 Place the thinly shredded cabbage in a large salad bowl with the broccoli or cauliflower (I used cauli in the photo, but broccoli would have been more colourful) and the spring onions. Stir the seeds and nuts over a medium heat in a dry frying pan, until lightly toasted and add to the bowl. Using the grating attachment of your food processor, grate the carrots. Then, leaving the carrots in the bowl, switch to the metal mixing blade, add remaining ingredients and mix until you have a bright orange dressing. Add to the salad bowl, mix well then scatter the dried fruit over the top. Variations: add some shredded red cabbage or strips of red capsicum. When we go to our farm in summer we pick all the zucchinis before we return to Canberra. As we only go every second weekend this means we bring back some huge ones, which have grown since our last visit – actually they are more like marrows – and some small ones which we pick in order to stop them growing huge before our return. The big ones are good for soup or for Zucchini with Tarragon and Sour Cream, one of our all-time favourite recipes for this versatile vegetable. The small ones are good for recipes such as Mustard-Glazed Salmon with Zucchini Ribbons or Zucchini Bake, another family favourite. 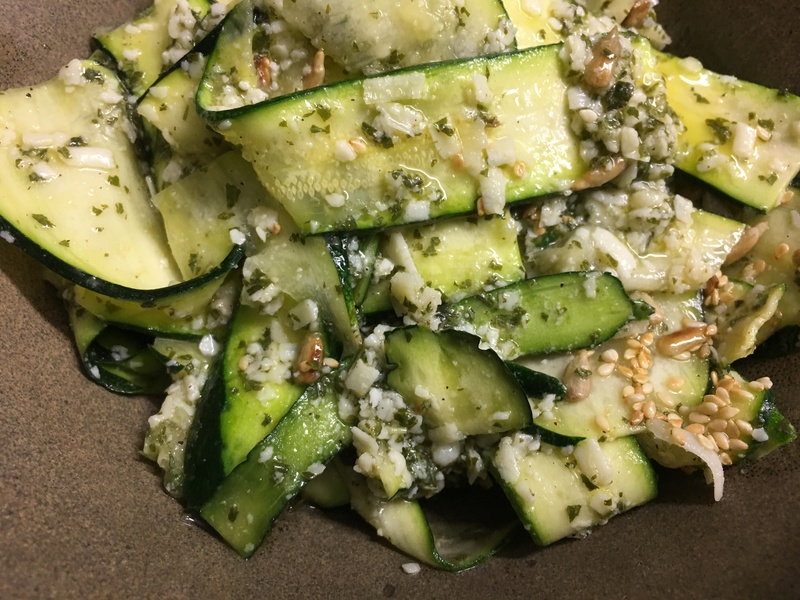 This salad with its vibrant green dressing is another good way to use smaller zucchini or as Matthew calls them, the ones that haven’t got away. It’s absolutely scrumptious and very healthy. If you have some zucchini flowers to garnish this salad they look quite spectacular. Unfortunately I didn’t have any for this photo. Wash zucchini and trim off the ends then slice them horizontally with a mandoline. Place in a salad bowl with the grated cheese and season with salt and pepper. Place all ingredients for dressing in food processor and process till you have a vibrant green dressing. Place seeds in a dry frying pan and stir over moderate heat until lightly toasted. Drizzle some of the dressing over the zucchini and parmesan and mix well. Garnish with the toasted seeds, the zucchini flowers (if available) and drizzle with a bit more dressing.